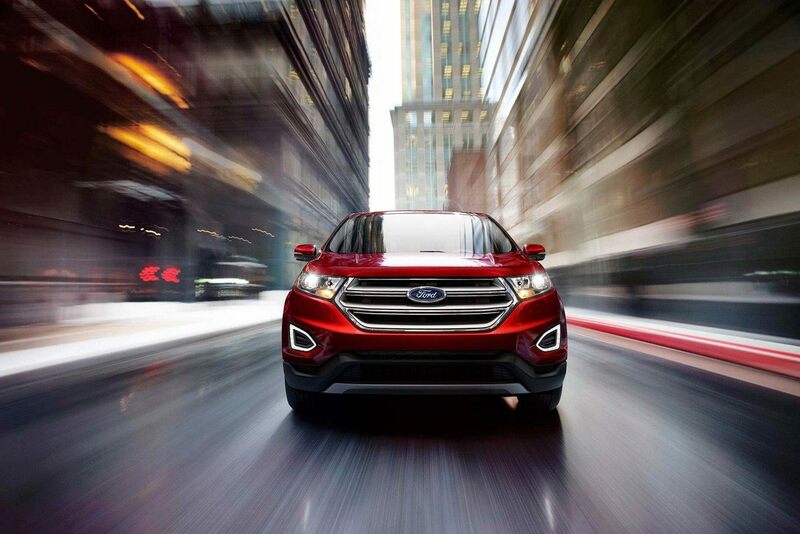 There are a lot of midsize SUVs on the market – but only one Ford Edge. Spirited performance and extreme versatility put the crossover in a category of its own. And for 2019, the class-leader receives several upgrades that make it better than ever. Four distinct trim levels are also offered, so there’s a perfect fit for nearly everyone. 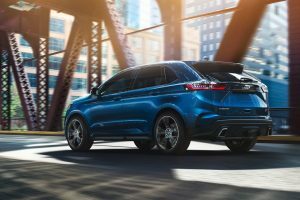 The five-passenger 2019 Ford Edge debuts a list of ‘firsts’, including a revised exterior and an all-new high-performance ST model. There’s also a new transmission and more standard equipment. Four exclusive trim levels are available: SE, SEL, Titanium and ST. Except for the specialized ST model, all are powered by an EcoBoost turbocharged 2.0L four-cylinder engine (250 hp, 275 lb.-ft.). The engine uses Auto Start-Stop for improved fuel economy. An 8-speed automatic transmission is used across the board. Front-wheel drive comes standard; optional all-wheel drive is available. Also, all models get a new-for-2019 rotary e-Shifter for selecting gears. Even though the SE is considered the base model, it’s extremely well equipped. Standard features include amenities such as automatic headlights, the SYNC infotainment system with 4.2-inch touchscreen display, automatic wipers and onboard Wi-Fi. Advanced driver assistance features are packaged together in the Ford CoPilot 360 Assist suite. The bundle includes Blind Spot Monitoring, Lane Keep Assist and Forward Collision Warning with Automatic Braking. A rearview camera and auto high-beams are also included. Outside, the SE draws attention with 18-inch Sparkle Silver wheels and dual bright exhaust tips. Bi-LED headlamps are also standard fare, as are LED taillights. The SEL builds on the SE by including a reverse sensing system and dual-zone climate control. Plus, there’s standard power front seats, a leather-wrapped steering wheel and an upgraded SYNC infotainment system. LED fog lamps and silver roof rack side rails give the crossover a sporty look. By far, the most luxurious Edge is the Titanium. The top-tier SUV comes with everything found on the SEL plus goodies like leather seats, a hands-free power liftgate, a wireless charging pad and ambient interior lighting. Noise-reducing front windows keep road sounds out, while a premium B&O audio system provides the tunes. Standard 19-inch wheels add to the high-class feel. The ST, which differs significantly from the rest of the Edge lineup, is the first SUV from the Ford Performance Team. As such, it flaunts sporty exterior design cues such as a black mesh grille and prominent ST logos. The cabin also gets upgraded with leather-trimmed sports seats with suede inserts. Under the hood, lurks an exclusive EcoBoost turbocharged 2.7L V6 engine (335 hp, 380 lb.-ft.). All-wheel drive (with disconnect) comes standard as does a specially-tuned suspension. Together, the performance upgrades help the SUV drive like a sports sedan. The 2019 Ford Edge is available now, at Fairley & Stevens, Dartmouth’s premier dealership. Stop by to take a test drive and determine which exclusive trim level is right for you. What Performance Systems are on the 2019 Ford Edge? This entry was posted on Tuesday, January 29th, 2019 at 10:00 pm	and is filed under Ford Edge. You can follow any responses to this entry through the RSS 2.0 feed. You can leave a response, or trackback from your own site.